Who forgets those wonderful summers of their childhood? Carefree days stealing chickens, escaping from jail, attempting armed robbery, hustling stolen eggs, and so much more. Ah, youth! There are not a few instances of boys who have been sent to “the Aid” ragged and penniless, ill-mannered and dirty, and unknown to schools or to soap and water, who have been discharged at the termination of their commitments with as much as $100 in cash, a good suit, an elementary knowledge of the three R’s, and a quite comprehensive understanding of the difference between right and wrong, and every prospect of becoming useful members of society. With that philosophy, there’s a blurry line between providing helpful vocational education and operating a temp agency for child labor. We don’t know whether “the Aid” hired out the children for domestic help or farm work, although a similar organization, the Catholic “Youths’ Directory” in San Francisco was doing exactly that, as discussed in an earlier essay. But it’s well documented that the Boys’ and Girls’ Aid Society had a long-standing relationship with Barlow and other Sebastopol berry growers, who relied upon the shelter to provide cheap field labor. About 100 boys – some as young as seven, according to an approving Press Democrat transcribed below – were paid four cents a box for picking the berries, which the growers sold wholesale for a neat 200% profit. 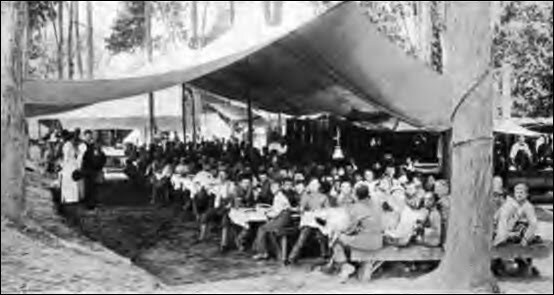 Other boys worked in local canneries, with all of the youths living the summer in a tent city on the Barlow ranch, two miles north of Sebastopol. The PD painted the operation as a kind of idyllic scout camp (“boys at the Barlow ranch enjoy outing, pick berries, earn money, and acquire habits of industry among pleasant scenes,” read one headline), but a couple of years earlier the newspaper described boys trying to escape, with local police dragging them back in handcuffs to collect a ten-dollar bounty for each kid. Again in 1907, the cops were on the lookout for a pair of escapees from their erstwhile bucolic frolic. “The boys’ hands will be found scratched and stained from the berries,” the paper helpfully tipped off would-be bounty hunters. Three San Francisco youths, named James Foster, Antonio Mazza and J. Carbauch, stole a $300 horse owned by Elisha Shortridge, of Pocket canyon, and when arrested by City Marshal Fred Matthews of Sebastopol they were all three riding Dobbin who was making time at the rate of a slow jog trot. The officer brought all three lads over to the county jail. District Attorney Lea has heard statements from the boys and has ascertained that two of them have done time with the Boys’ and Girls’ Aid Society and he hird had escaped after having been sent to the same institution. From what he learned of the characters of the lads they are bad ones. The three lads who rode a horse away from a pasture near Forestville last Sunday and were arrested in Sebastopol, were to have been turned over to the officers of the juvenile court in San Francisco Saturday, but owing to the fact that they took part in the jail break Friday night, they will be detained here until after this matter is straightened out. The boys are undoubtedly bad little characters. The mother of the youngsters arrived from the city Thursday evening and admitted to the officers that she is aware that her son is not of the best. While returning to this city Friday night on the Bennett Valley road not far from the Catholic cemetery, Mr. and Mrs. J. C. Pedersen were held up by three boys who were traveling along the road in a wagon. Mr. Pedersen was driving his buggy horse at the time and the animal was coming along the road at a lively gait, and when one of the youths pointed a gun at the Pedersens and ordered them to stop, the horse failed to obey the summons and nothing more was heard of the youthful highwaymen. It was though when the report was first brought to town that they were the boys who had escaped from the county jail, but this was a mistake. Truant Officer James Samuels took a quartette of boys to District Attorney Clarence Lea’s office on Monday afternoon. The lads have been following, it is alleged, a systematic plan of chicken stealing in different sections of the city. Their plan of campaign has been followed with considerable success. Their chief stock in trade in the pursuit of thievery has been a small well-trained dog, Officer Samuels says. The dog would invade yards and roosts and frighten chickens in the direction of the boys who would capture them and put them in sacks. So far no complaints have been lodged against the gang. The case of two youths, who have not been attending school and who took a couple of chickens recently, was before Judge Emmet Seawell Friday. The court continued the matter until Monday to make some inquiries into the case. Judge Seawell said there was nothing vicious about the actions of the two boys, John and Henry Robinson, so far as he could see, but that he was not satisfied with the environment of the boys and that they should be attending school instead of being allowed to roam at will, and particularly without restraint at nights. The court wants to ascertain if the moral influence exerted on the boys is what is should be. Henry and John Robertson, two boys who were recently mixed up in chicken stealing in this city, were on Monday ordered committed to the care of the Boys’ and Girls’ Aid Society of San Francisco. The lads will there be given an opportunity to start anew and learn a trade and otherwise equip themselves for life if they show the disposition to do so. Complaint was filed in the Superior Court Monday by H. M. Le Baron of Valley Ford, charging Ethel Saunders, age 15, and Henry Saunders, age 10, with being incorrigibles. The complaint declares that the children are under bad influences when with their mother and that they have no father. Mrs. E. R. Saunders is said to be a woman of bad character and her children allowed to run wild. The boy is accused of stealing and the girl with immorality. The Court will hear their cases and probably send them both to the reform school. The two young men, Rogers and Halleck, who were recently arrested at Camp Meeker for robbery and arson, will probably be allowed to enjoy all the fruits of their crimes. A sister of young Rogers arrived here from San Francisco this morning and at the county jail told her brother that his folks would take no part in the matter. The young man pleaded for assistance, but the girl told him that the best place for him was in the jail, as then his parents would not have to worry about his whereabouts. It seems that the relatives have decided to let the young chaps sweat it out along their own line. Will Mayer, the 13 year-old son of Mr. and Mrs. John Mayer, was taken into custody yesterday shortly before noon by chief of Police Rushmore and Officer Boyes as incorrigible. It is claimed that he has been stealing numerous articles from residents in the northern part of the city. He refused to answer questions and was locked up. Late in the afternoon J. L. and Will Allen 12 and 14 year old, were taken to the police station and thoroughly questioned. They admitted having been involved in a number of scrapes with young Mayer and told of the petty crimes committed. Mayer when cornered would admit his part, but denied everything as long as possible. No decision was reached as to what would be done in the case. A company of boys composed of Will Mayer, J. L. and Will Allen were arrested Friday by Chief of Police Rushmore and Officer Boyes for stealing chickens and eggs. Young Mayer is about 13 years old, while his companions are 12 and 14 years old respectively. The boys have been doing a regular business along the creek bank and in the yards of a number of residents of this city. One instance is given where one of the boys went to a store and purchased eggs at 30c a dozen, having charged them to his parents, and then going with them to the Jap restaurant and selling the hen fruit for 20 cents. The officers are puzzled to know what to do with the chaps. Young Mayer has given them trouble for several months past, particularly in playing hookey from school, and he and his companions are considered almost incorrigibles. Will Mayer was taken before Judge Emmet Seawell Saturday morning and after a thorough examination the boy was committed to the Boys’ and Girls’ Aid Society of San Francisco until the further pleasure of the court. The young man was very reserved and indifferent until the court passed sentence upon him. He then broke down and begged to be given another chance and he would prove that he could be as good as any body. He then wanted to know if he could come home in August in time for the opening of school here and the court said he would see about it. The information charging Roswell P. Rogers and Vernon Hollett, the San Francisco boys with grand larceny, was dismissed before Judge Emmet Seawell Wednesday morning. 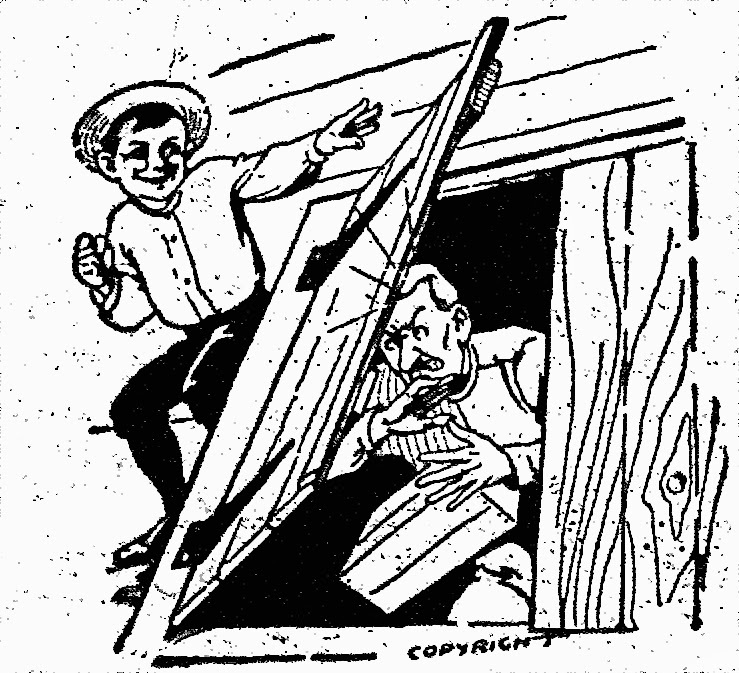 Later Deputy Sheriff Donald McIntosh swore to complaints charging the youths with burglary. They are the lads arrested at Camp Meeker, who have confessed to burglary, incendiarism and other crimes. The boys will be given a preliminary examination before Justice A. J. Atchinson in a few days on the burglary charge. They have confessed the crime and there is no doubt but that they will be given a good long term in the penitentiary, for the matter will be presented to the court in such matter will be presented to the court in such manner as to get evidence of the arson charge against them into the record. The maximum penalty is fifteen years. Rogers and Hallett were arraigned before Justice Atchinson late Wednesday afternoon and their case was set for trial Saturday morniing. Rogers declared he wanted time to write his father and have the latter come here and secure an attorney to represent him and his companions in crime. William States, age 17, and Claude Chisister, age 14, two boys from the Boys’ and Girls’ Aid Society engaged in picking berries at Barlows near Sebastopol, have run away and the police and sheriff have been requested to assist in recapturing them. The boys’ hands will be found scratched and stained from the berries. The boys at the Barlow berry farm have been picking seventy crates a day of the blackberries, raspberries and Loganberries that constitute almost the entire crop of 160 acres. This is the height of the season for blackberries, which will close in less than a month, although the “season” is over there will be work for 20 or 25 late-stayers to gather the fruit that ripens late. The boys at this farm are those from the Boys’ and Girls’ Aid Society of San Francisco–“the Aid,” as the boys themselves call it for short. There are nearly 100 of them at the berry farm, and their ages range from 7 to 16. Most of them have been placed in care of “the Aid” for reason of moral delinquencies of various sorts; some of them are there because they have no parents to care for them, or have parents who are unable, unwilling, or unfit. But nearly every boy in the camp has “done something” which is regarded as reprehensible by those who best know what boys should or should not do. The superintendent of the camp, George C. Turner, denies that he has any “bad boys” in his industrial and industrious army. “Simply abnormal,” is the way Mr. Turner describes them. Truth to tell, there are some quite serious offenses in the catalogue of their crimes–offenses of whose gravity the offenders themselves have almost no conception. These reflect the influence of evil surroundings, and also make clear the good that “the Aid” does. In surrounding these boys with other atmosphere than that of the jails which would otherwise be their abodes. Many and many a mischievous boy has become vicious and vile because he was sent to jail for some boyish mischief whose character and extend he did not comprehend. Many and many a mischievous boy has been turned from this course by the good influence of “the Aid”–not only boys, but girls, too; but there are not but boys at Barlow’s. Next Thursday the Aid Society boys, who have been camped on the Barlow ranch two miles north of Sebastopol for the past three months, will fold their tents and return to San Francisco. A few figures regarding the work that has been done by these boys since they came to Sebastopol early last June are given. In the party there are 130 boys and they have gathered the berry crop of 90 acres. Of this area 75 acres belong to Mrs. Barlow, 10 acres to W. J. Roaf, and 5 acres to William Taylor. The total number of trays picked on the 90 acres is 50,000. This is equal to 250,000 pounds, or 125 tons. The amount paid for picking was $16 per ton, or $2,000 for ninety acres. The berries were sold for $50 per ton, leaving the grower a balance of $34, out of which he had to pay for cultivation and other work. In addition to picking berries the boys did various other things. For three weeks past a number of the lads have been working in the Sebastopol cannery and they have drawn in wages $400 per week. Superintendent Turner informed a Sebastopol Times representative Friday that the earning of the boys since coming to Sebastopol three months ago amount to about $3,500.